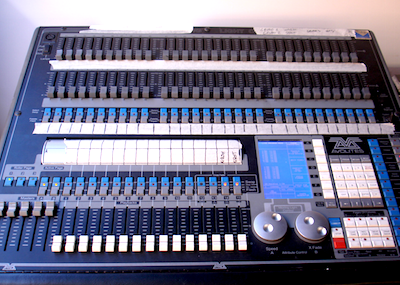 Following on from some recent discussion in the lighting control hardware vs. software debate, On Stage Lighting considers some trends in the market and the life cycle of specialist lighting console hardware. Some time around 2011, the place I’m currently engaged to teach at bought a MagicQ Pro 2010 as a teaching desk. It was used to teach theatre-style command line cue stacking and also concert busking and lighting control for media and pixel mapping. The hardware was well used for a few years until the theatre-style learning was given over to a more theatre ‘standard’ ETC Gio and various Ions that were then added to the inventory. Still, the MagicQ as a system still had many learning benefits in a range of programming styles as well as cheap and easy access to a pro level lighting desk via their laptops. The MagicQ Pro 2014 came out and it became quickly apparent that the 2010 platform was not aligned with future ranges that used a combined platform. The sound of nails hammering into coffins started. It was only a matter of time before development of 2010 platform was going to slow to a halt. Cham Sys have now discontinued making the Pro 2014 and earlier consoles and the Pro 2010 platform will have ceased development of any kind in the next couple of years. Still, a ten year life doesn’t seem totally unreasonable these days does it? This leaves a piece of hardware awaiting its demise in a couple of years as the updates stop coming. It happens. Someone purchased the last Classic Avo Pearl 2008 (see image), someone invested in the last Grand MA 1. Even more recently, perhaps you now have the ‘old’ Avo Tiger Touch that needs a hardware upgrade to move forward. The desks still work while you can get parts for them but the stream of ‘new and shiny’ stuff for them slows to a trickle and then stops. This isn’t a problem particular to lighting desks. In the non-specialist field, at some point your old laptop will no longer run any of the supported operating systems from a vendor. However, we expect to keep a more regular schedule of generic hardware purchases not least because they are cheaper than a large and extremely niche piece of specialist kit. Back in the land of lighting control, we also have a PC Wing Compact that has a slightly brighter future. This is because the small, cheap hardware will continue to work with free software updates for longer as long as we continue to have reasonably recent generic hardware in the form of laptops etc. Stuff everyone has these days. The wing is a super cheap hardware solution, while not being as comprehensive as a full desk. In the ‘old days’ Cham Sys were first to the small wing / mini console market, now everyone has an offer like this. Hire companies are now finding investing in consoles even more of a loss leader than ever. The cost of ownership of the big hardware is high and many freelance LDs own their personally preferred smaller hardware, now relatively cheap to get into. Making custom PC based ‘full’ consoles is a serious project for many. Meanwhile, a sluggish hire company with the last Grand MA 1 on the shelf finds it quickly becomes nearly worthless other than for parts to keep other soon-to-be worthless hardware going a little longer. When the expensive hardware has to be scrapped, I can’t help wondering if further big hardware is a purchase that will always guarantee to return the investment. In teaching, we are not in the hire business of making money from kit and so it comes down to being able to learn the most relevant and current systems of the time. With console hardware lasting increasingly shorter and shorter periods of time due to the pace of technological change, and our main focus being on what is and will be the most relevant platform for learners, big purchases start to look less attractive in favour of diversity and agility. Vendor, give me a PC wing from each manufacturer please!